I'd like to buy a place and work from home. What do I need to know? Looking for a new place to accommodate a home office? Annette Holmgren of BOND New York tells you how you can make it happen in this week’s Buy Curious. I’m looking to buy an apartment and plan to use an extra half-bedroom as an office. Am I better off going for condos or co-ops? What do I need to know? This extra room often lacks a window (or a door or both)—and ventilation can be an issue—making it illegal to market the place as a real two-bedroom. However, if you’re looking to save your pennies, a windowless room could be the answer as they typically cost 30 to 50 percent as much as a legal bedroom of the same size. Plus, the room can be perfect as a home office—one where you might actually get some work done since you won’t be distracted by the view. As for which would be better—a condo or a co-op—it really all depends on you. Holmgren says having a home office tends to be acceptable in even the strictest of co-ops, but running a business out of your home is probably not—in both co-ops and condos. So if you’re looking to run an actual business out of your home (rather than just have a private spot to do your work), check the building’s bylaws and zoning before doing anything. Condos tend to have higher price tags, but fewer rules (when it comes to subletting and renovations, for example). Co-ops tend to be cheaper, but come with more regulations from the board. Ready to set up your home office in one of these units? 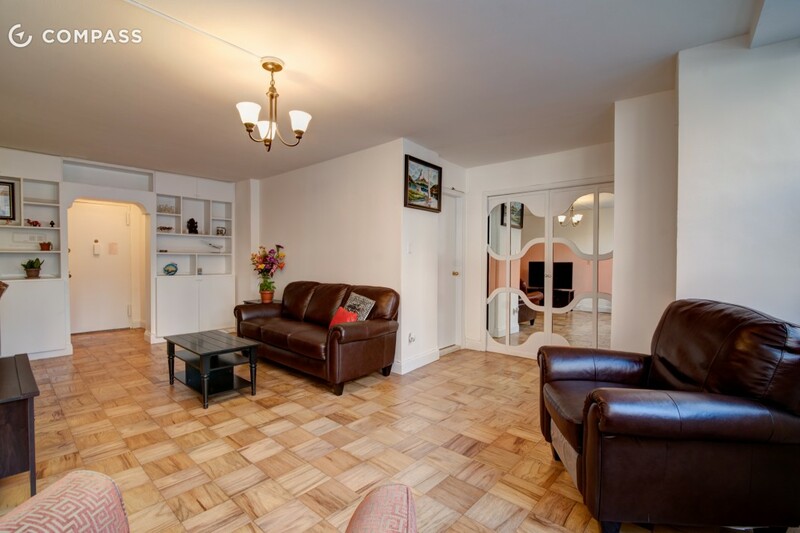 Manhattan Valley one-bedroom, one-bath co-op, $649,000: This 800-square-foot one-bedroom at 410 Central Park West between West 100th and West 101st streets needs a little TLC, but has good bones. There’s a large master bedroom, high beamed ceilings and a separate dining area that you can turn into an office. The prewar full-service building boasts a full-time doorman, live-in super, bike room and a package room. Maintenance is $1,301 a month. Upper East Side two-bedroom, one-bath co-op, $469,000: Located at 206 East 90th Street between Second and Third avenues, this renovated convertible two-bedroom has a flexible open floor plan with an eat-in kitchen, master bedroom, windowed bathroom and bonus room that can serve as either a second bedroom or an office/den. Amenities in the pet-friendly building include a common garden with BBQ grills, bike storage and laundry. Maintenance is $1,151 a month. Midtown East one-bedroom, one-bath condo, $925,000: This junior-four at 150 East 56th Street between Third and Lexington avenues has been renovated and now boasts a modernized kitchen with updated appliances and a remodeled bathroom with contemporary fixtures. 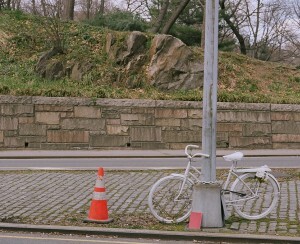 The doorman building has on-site laundry, bike room and storage room. Common charges are $1,104 a month and taxes are $706 a month. Upper East Side two-bedroom, one-bath condo, $775,000: This converted two-bedroom at 400 East 90th Street between York and First avenues has a galley kitchen with stainless steel appliances and two nicely proportioned bedrooms—one of which can serve as your home office. The condo building has tons of amenities, including a 24-hour doorman, roof deck, fitness center, spa, playroom and business center. Common charges are $734 a month and taxes are $604 a month. 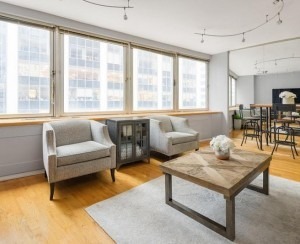 Financial District one-bedroom, one-bath condo, $1.049 million: This condo at 90 William Street between Platt Street and Maiden Lane is currently configured as a one-bedroom, but can be converted to add a home office. The unit features white oak floors and a stainless steel kitchen. Building amenities include a gym, 24-hour concierge and live-in super. Common charges are $1,187 a month and taxes are just $10 a month. When is a two-bedroom actually a junior-4? When is a one-bedroom just a studio?